Meet Jack; the detective with the nose for crime. On duty, he snaps at the heels of local felons, and digs out hidden scams. Off duty he’s Sergeant Russell’s pet. (oops!) companion. 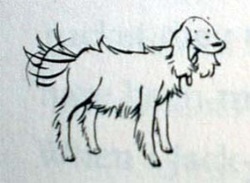 Jack is assisted by his second-in-command, Foxie Terrier, and by his slightly dim friend Lord "Red" Setter. 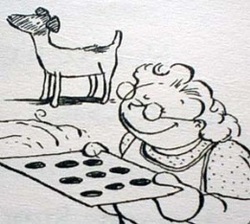 And let's not forget Auntie Tidge, that ever-loving supplier of comfort, biscuits and (whisper it) baths. Characters in the first few stories include the following. All pictures are by Janine Dawson. Jack Russell. Narrator, hero and top dog of the Jack-Pack. Jack has his own way with words. You can read about that . Sarge (Sergeant Russell). A policeman, and Jack's landlord and best friend. He is kind and helpful, and good in a crisis. Auntie Tidge (Miss Russell). Sarge's aunt, a big-hearted person who thinks the best of everyone. Jack and Foxie adore her. ﻿Foxie. Used to be a street dog, now lives with Auntie Tidge. 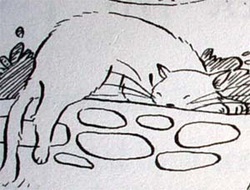 He is greedy and cranky, and he has imaginary fleas, but Jack can rely on him in a tight spot. Foxie loves his old boot, food... and Auntie Tidge. Lord Red (Uptown Lord Setter). Red is fast, enthusiastic and a bit dim. He lives with Caterina Smith at Uptown House, and is afraid of being dognapped. Polly Smote. 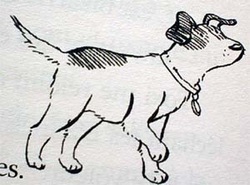 A sharp-natured dachshund, who is a friend of Jack's. She lives with Gloria Smote. Jill Russell. 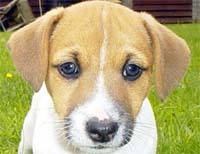 A Jack Russell Terrier who lives with Jack and Jill Johnstone at the station. Jack thinks she's just ace! Shuffle the pug lives with Walter Barkley. Shuffle is slow, and looks on the gloomy side of life, but he's a loyal member of the Jack Pack. Fat Molly. A cat, and an enemy of Jack and Foxie. She lives with Kitty Booker at the library... when she isn't staying with Auntie Tidge. She later forms an unlikely friendship with Preacher. The Squekes. Three little hairy, yaffling dogs who do everything together. They live with Dora Barkins and are inordinately attached to their plastic chop. Preacher is Jack and Jill Russell's little son, who arrives later in the series. Other later arrivals include the Awful Pawful and Ralf Boxer. Doggeroo is the town where Jack and his friends live. It has a river, a train station, a showground and reserve, and all the amenities of the average town. It's a good place, with plenty of room to run around. Jack's stories are available in the US, the UK, and Canada. The UK editions have different covers, and in the US editions, Foxie is known as Foxy. 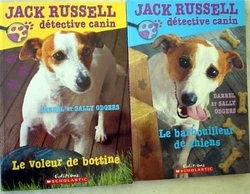 The French Canadian editions have been translated into French and some of the names have been changed. See below for some of these. 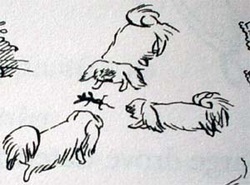 Doggeroo is known as Val Cabot. Sarge is known as Simon. Auntie Tidge is Tante Adele. Lord Red is Rubis and Caterina Smith is Catherine Samson. Polly is Rosette. Gloria Smote is Gloria Sansoucy. Jill Russell is Jackie Russell, and lives with Martin and Martine. Shuffle is Arthur. Walter Barkly is Antonio Boyer. Fat Molly has become Augustine. Kitty Booker is Lison Lebouquin. The Squekes are Les creve-tympans and live with Doris Lavoie. Ralf Boxer is Ralph Bouvier and lives with Justine Bouvier. The blanket Auntie Tidge knitted.